Since wheat flour is made partly from protein and partly from starches, it makes sense to try to imitate this consistency as far as possible. Therefore, use two types of flours in your blend: whole grain flours to replace the protein and starches to hold the blend together. Choose your flours and starches from the lists and make your own blend by using roughly 40% of whole grain flours and 60% of starches. 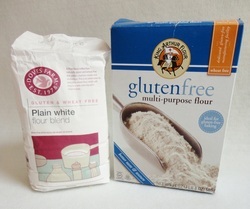 Put the flours and starches into a container, mix and you have a ready-to-go blend for your next baking session. Remember that each flour and starch has its own properties and taste and you may need to experiment a little to achieve your desired result. For example, the taste of buckwheat flour is quite strong, so use it sparingly, unless of course you want that taste to be prominent. You don’t necessarily need to use this blend, but can choose your own combination. Enjoy experimenting!